Stage Play 'Billie' is Back for One Night Only! Stage Play ‘Billie’ is Back for One Night Only! Sold Out Stage Play “Billie” is Back for One Night Only! “Billie” tells her story in Compton, California during the late 80s to 90s as a young girl pursuing her dreams to become a hip-hop artist during the Death Row music era, while trying to survive the poverty, abuse, and addiction facing her family. “Billie” will captivate audiences with its gritty realism. The author boldly opens a window into her life—a life with her drug-addicted mother, an abusive father whom she both idolizes and fears, and a sister who has dark secrets. Actress Janice Robinson plays the lead role of Billie and gives a performance for the ages that will not be forgotten. Robinson, as well as a team of actors, gives a performance that will give you chills. These talented actors portray perfectly what life was like for Billie and allow you to take a look from her perspective. The short film The Red Barn has gone on to win awards and garnered critical acclaim because of its portrayal of the life of young Billie set in the pulsating enigma of Compton, California in the late 1980’s and the 1990’s. The book that has impacted the lives of so many now comes to stage. The intimate details of the book are not lost as this emotional play portrays every raw detail. One Of Our Own . . . 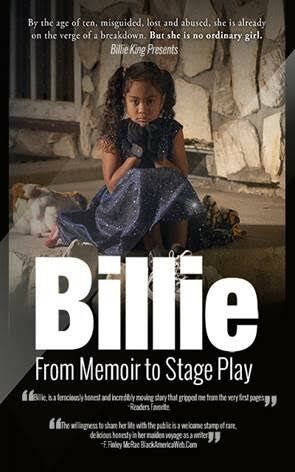 Thank you Lee Bailley’s EurWeb.com for a great article on “Billie” the stage play. Enjoyed by many. “Billie” commanded a return performance, which happens tonight June 30, 2016. Author, Director, and Producer Billie King brings your heart and soul from the pages of her memoirs to a grand, gripping, raw performance right in front of your eyes. Looking forward to the “Red Barn”.